Homeopathy Works Even on Nano grounds!! ‘‘Homeopathy has been a conundrum for modern medicine. Its practitioners maintained that homeopathic pills got more potent on dilution, but they could never explain the mechanism scientifically enough for the modern scientists,’’ said Bellare. Synonyms: Apigenin glycosides, Arnica montana, Asteraceae (family), asterogenic acid glycosides, bairnwort, bayogenin, Bellidis flos, Bellis sylvestris, bellissaponin, Bellorita, besysaponin, bisdesmosidic glycosides, bruisewort, Chrysanthemum leucanthemum L., common daisy, Compositae (family), consolida, daisy, day’s eye, dog daisy, English daisy, European daisy, flavonoids, flavonol glycosides, Gänseblümchen (German), glycosides, hen and chickens, Herb Margaret, La Paquerette (French), lawn daisy, little daisy, Madeliefje (Netherlands), Marguerite, Maslieben (German), Maya, meadow daisy, monodesmosidic glycosides, oxeye daisy, polyacetylenes, polygalacic acid, red daisy, saponins, Sedmikráska chudobka (Czech), triterpenoid glycosides, triterpenoid saponins, virgaureasaponin, wild daisy. Note: Daisy is also the common name for oxeye daisy, Chrysanthemum leucanthemum L., another weedy species found in fields and along roadsides throughout the United States. This species is native to Europe and Asia, and has also been naturalized as a weed in North America. Background: Bellis perennis is a common European species of daisy. Although many other related plants are also called daisy, Bellis perennis is often considered the archetypal species. It is sometimes called common daisy or English daisy. It is native to western, central, and northern Europe, but is commonly found as an invasive plant in North America. The medicinal properties of Bellis perennis have been recorded in herbals as far back as the 16th century. John Gerard, the 16th century herbalist, recommended English daisy as a catarrh (inflammation of mucous membrane) cure, as a remedy for heavy menstruation, migraine, and to promote healing of bruises and swellings. Infusions of the flowers and leaves have been used to treat a wide range of other disorders including rhinitis, rheumatoid arthritis, and liver and kidney disorders. An insect repellent spray has also been made from an infusion of the leaves. A strong decoction of the roots has been recommended for the long-term treatment of both scurvy and eczema, and a mild decoction may ease complaints of the respiratory tract. Bellis perennis has also been used traditionally for treating wounds. Chewing the fresh leaves is said to be a cure for mouth ulcers. In Homoeopathy, Bellis perennis is often used in combination with Arnica montana to treat bruising and trauma. 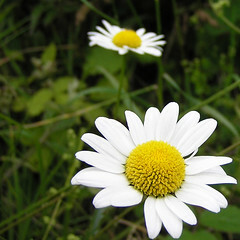 Common daisy is widely used in Homoeopathy, but is currently only rarely used in herbal medicine. Although homeopathic dosing is generally recognized as safe (GRAS; U.S. Food and Drug Administration (FDA) designation), there is a lack of available scientific evidence to support claims for effectiveness related to the use of Bellis perennis. More research is needed in this area. Recent research has explored the possibility of using the plant in HIV therapy. DISCLAIMER: These uses have been tested in humans or animals. Safety and effectiveness have not always been proven. Some of these conditions are potentially serious, and should be evaluated by a qualified healthcare provider. Bleeding (postpartum, mild): Homeopathic Bellis perennis has been used for bruising, bleeding, and recovery from surgery. Additional study of Bellis perennis alone is needed to make a firm recommendation. WARNING: DISCLAIMER: The below uses are based on tradition, scientific theories, or limited research. They often have not been thoroughly tested in humans, and safety and effectiveness have not always been proven. Some of these conditions are potentially serious, and should be evaluated by a qualified healthcare provider. There may be other proposed uses that are not listed below. Analgesic (pain reliever), antifungal, anti-inflammatory, antimicrobial, antispasmodic, antitussive (suppresses coughs), arthritis, astringent, blood purifier, breast cancer, bronchitis, bruises, burns, bursitis (inflammation of bursa), childbirth (cesarean sections, episiotomy), cancer, catarrh (inflammation of mucous membrane), circadian clock acceleration, concussions, demulcent (soothes inflammation), digestion enhancement, diuretic, dysmenorrheal (painful menstruation), eczema, edema (post-operative and post-traumatic), emollient (soothes skin), expectorant (expels phlegm), fractures, HIV support, inflammation (tenosynovitis, styloiditis), insect repellent, jet lag, joint disorders (blood in joint), joint inflammation (epicondyle), joint problems (dislocations), kidney disorders, laxative, liver disorders, menorrhagia (heavy menstrual bleeding), migraines, mouth ulcers, ophthalmologic (eye) uses, osteoarthritis, periarthritis humeroscapularis, periodontitis / gingivitis, pneumonia, post-surgical recovery (plastic surgery), purgative, rheumatism, scurvy, skin diseases, soft-tissue injury (acute), sports injuries, sprains, tissue healing after surgery (abdominal), tonic, trauma (pelvic organ), wounds. Based on available scientific evidence, there is no proven safe or effective dose for Bellis perennis. One cup of tea made from 2 teaspoons of dried Bellis perennis herb steeped in 300 milliliters of boiling water for 20 minutes, and then strained, has been taken two to four times daily. Typical homeopathic doses used are 1 or 2 (6C or 30C potency) tablets dissolved on the tongue. For general acute conditions, one dose every two hours repeated for a maximum of six doses has been used. For less acute conditions (e.g. seasonal or chronic), one dose three times a day between meals for no more than one month has been used. Children (younger than 18 years): Based on available scientific evidence, there is no proven safe or effective dose for Bellis perennis. In general, 1 or 2 homeopathic 6C or 30C potency tablets dissolved on the tongue have been used. For general acute conditions, one dose every two hours for up to six doses has been used. For less acute conditions (e.g. seasonal or chronic), one dose three times a day between meals for no more than one month has been used. DISCLAIMER: Many complementary techniques are practiced by healthcare professionals with formal training, in accordance with the standards of national organizations. However, this is not universally the case, and adverse effects are possible. Due to limited research, in some cases only limited safety information is available. Allergies: Avoid in individuals sensitive or allergic to Bellis perennis products or any of their ingredients. Respiratory allergies have occurred in sensitive individuals. Side Effects and Warnings: In general, Bellis perennis appears to be well tolerated when used at homeopathic doses. As an herb, however, Bellis perennis may affect the clotting cascade, resulting in blood clotting. Common daisy may also result in stunted growth, although there is a lack of scientific evidence supporting this. Patients at risk for coagulation disorders such as strokes or blood clots, or patients with anemia should use cautiously. Pregnancy and Breastfeeding: Bellis perennis is not recommended in pregnant or breastfeeding women due to a lack of available scientific evidence. Avoid use at traditional herbal doses during pregnancy and breastfeeding because of the possibility of growth retardation in the fetus and infant. Interactions with Drugs:Bellis perennis may affect coagulation and it is unclear how this herb may interact with medications that may increase the risk of bleeding. Examples include aspirin, anticoagulants (“blood thinners”) such as warfarin (Coumadin®) or heparin, anti-platelet drugs such as clopidogrel (Plavix®), and non-steroidal anti-inflammatory drugs (NSAIDS) such as ibuprofen (Motrin®, Advil®) or naproxen (Naprosyn®, Aleve®). Caution is advised. Interactions with Herbs and Dietary Supplements: Bellis perennis may affect coagulation, and it is unclear how this herb may interact with herbs and supplements that may increase the risk of bleeding. Caution is advised when taking with herbs and supplements that may increase the risk of bleeding, such as garlic or Ginkgo biloba. This patient information is based on a systematic review of scientific literature edited and peer-reviewed by contributors to the Natural Standard Research Collaboration (www.naturalstandard.com): J. Kathryn Bryan, BA (Natural Standard Research Collaboration); Jessica Clubb, PharmD (Northeastern University); Molly Davis, PharmD (University of Rhode Island); Antoinette Edmondson, PharmD (Massachusetts College of Pharmacy); Nicole Giese, MS (Natural Standard Research Collaboration); Petra Jancar, PharmD (University of Ljubljana); Toni M. Schaeffer, PhD, PharmD (Albany College of Pharmacy); Shaina Tanguay-Colucci, BS (Natural Standard Research Collaboration); Wendy Weissner, BA (Natural Standard Research Collaboration).